Yesterday I took the 7th pair of shorty socks off the needles; they still have loose yarn ends inside, but I couldn't resist a family portrait of the group (with the comment that as usual some of the colors aren't their real color in these pictures. They're laid out in order of making, starting with the red pair in the lower left, and then counter-clockwise. They have fanciful names, based on the colors: Play Ball (1st pair), Rainy Day Roses, Sunny Day Roses, Desert Canyon Sunset, Tropical Lagoon (at the top, in case you've lost track), Summer Meadow, and the newest, Fiesta. The green in Rainy Day Roses is a different green than on the other pairs, and photographs much truer to its real appearance, a. It was Ella rae Classic #75. The other greens are all Ella rae Classic #90, a rich emerald green; it looks closest to its real color in the image just above. All the pinkish-purplish stripes are the same yarn. The blue stripe on Play Ball is the same yarn as on Summer Meadow. The purple stripe at the top of Rainy Day Roses is the same yarn as the purple stripes in Desert Canyon Sunset. Both the pinkish-purplish and the purple yarn are Plymouth Galway Nep, so the little "speckles" of color in them are real, not an artifact. Those bits of other colors make the stripes more interesting, I think. Tropical Lagoon has only two yarns, the turquoise and the variegated. Mountain Colors Bitterroot Rainbow is in both the Desert Canyon Sunset (a total of five rows per sock) and in Summer Meadow (the ribbing, as well as more rows.) Fiesta has a small amount of a different purple yarn (in whole socks, it proved to become overly soft and stretchy with multiple washings, so keeping it to narrow stripes should allow other yarns to scaffold it. 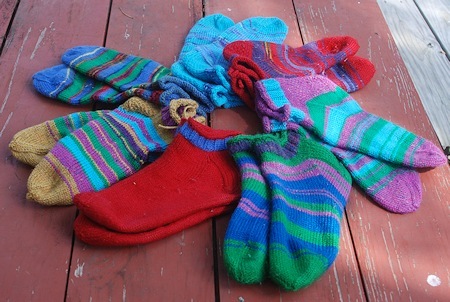 Yarns used as leftovers from one-color "regular" socks are both greens, red, turquoise, medium blue, variegated blue/aqua/lavender, and both purples. Yarn from intact skeins: the pinkish-purplish, Bitterrroot Rainbow, and the mustard-gold. The mustard-gold is the only one originally purchased as a striping yarn; it was chosen to mix with Bitterroot Rainbow (after I tried out that yarn and found it made stunning stripes), burgundy, hunter green, and brown. I don't want solid-color socks in that color, but as a stripe it'll be fine. In most of the socks, the heel flap is done in Eye of Partridge, with that pattern continued under the heel a short way for reinforcement and cushioning. This is a photo of my first attempt at Eye of Partridge. 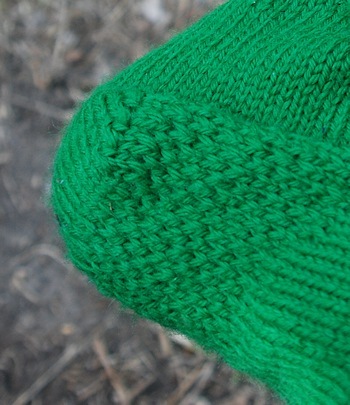 It's a slip-stitch pattern that offsets the slipped & knitted stitches every right-side row (all wrong-side rows are purled--on the flat part of the heel flap--and knitted if the pattern's carried under the heel (which it isn't, here.) It wears better under the back strap of my sandals than a regular heel stitch does. Aside from the short bit of ribbing that helps hold the short upper part away from the ankle, everything else is done in knit stitch. Toes are anatomical (there's a right and a left sock), fitted to my own feet; the same basic sock could be made with symmetrical toes, of course. Since I've shrunk the amount of leftover yarn from regular socks, Fiesta may be the last shorty I knit for awhile. I need more regular socks anyway, since the Year One socks are starting to wear out. I have a royal blue pair most of the way down the five inches of ribbing; when it reaches the heel flap, I'll put a following pair (possibly Mountain Colors Indian Paintbrush, or a burgundy) on the needles. I also want to do a dark green this fall, and a black pair, as well as several more pairs of the Herdwick yarn that's so wonderfully warm. What a fabulous and funky collection. Really enjoy the fiesta socks, and the new stitch you've tried. 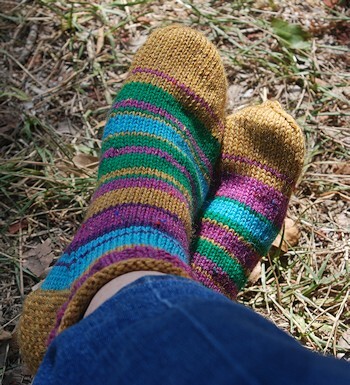 I first used Eye of Partridge on the third pair of socks I made, back in 2012. I didn't use it again for awhile because it seemed slower than regular heel stitch and I was desperate to finish enough socks that I wouldn't have to wear commercial socks again. But it's so pretty...I came back to it when I had more socks. Still, if I want a pair very quickly, I'll go with regular heel stitch, where I don't have to remember which row I'm on. My name is Karen and I'm having an indecent degree of sock lust (especially since my feet are usually so warm that I only wear socks on the coldest of winter days). Thank you! I think my mother (who knit much better than I do--she made gorgeous sweaters) would be amazed (appalled?) at how I use color, but I am having fun with it. I have the opposite situation with my feet, which can be cold in an air-conditioned building that isn't cold to the rest of me. So I've always been happier in socks, and the wool socks also insulate my feet from hot pavement when wearing sandals. Strange but true. These socks, because they're not tight at the ankle and don't come up any higher, actually make my feet cooler when I'm walking or riding. But I understand people who are more comfortable without socks. Regarding the wool insulating you from heat as well as cold takes me way back to a physiology lecture I had at university about how the early physiologists discovered about heat regulation in climates that are hot during the day butthat can be cold at night. The gist of an entertaining lecture was that sometime at the turn of the 20th C a physiologist decided to investigate how camels managed to retain water and in order to do so he needed a camel. He went to a country where camels were common but had great difficulty finding anyone prepared to sell him a camel. Camels were your wealth, essentially your capital and you do not dispose of your capital lightly. Eventually he found someone prepared to sell him a camel, but they insisted on delivering the camel after dark, he thought this strange, but wasn't in a position to object and the camel was duly delivered. When the physiologist inspected the camel the next morning he found it had been shaved! Camel hair is of course a high quality fibre, one we value to this day and the vendor had removed it all before delivery. Our physiologist was not pleased, but he had his camel and prepared to start his experiments on how the camel retained water so well. However the camel quickly fell ill and after a lot of investigation he learnt that the camel's fur was an essential part of it's heat regulation system, that despite being something northern Europeans used to keep warm it was also essential for the camel to keep cool.He never did get round to doing the water studies, but he made his name with the heat regulation work. I remember reading about wool insulating both ways when I was in junior high and digging into old books in the library (the library had mostly old books!) I read about the goat and camel hair tents the Bedouin used, and their wearing wool outer robes in the desert. We lived in a climate that could be very hot for six months or more. So one year, I decided to wear my felt "circle skirt" to school on the first day, since September was always hot. And I got flak from the teacher, from a friend of my mother's who saw me walking home in it, and from my mother (who had gotten flak from her friend.) But it was COOL, in the temperature way though not the style way. Cooler than the cotton skirts. I never had wool socks as a kid, but when I got wool socks later (for myself) I soon found out that they were comfortable on my feet for hiking in both hot and cold weather, and though they wicked away sweat, they also regulated the temperature of my feet so I didn't get foot cramps from sudden chilling. Gradually (and self-indulgently) I started wearing wool socks more and more, then all the time. (Being a writer helps with wardrobe choice! So glad not to have to wear stockings to an office.) The problem became fit, as manufacturers began using more and more elastic yarns that cut into my leg and were bad for circulation. REad something recently about outdoor gear in which one man touted wool shorts for hiking and for biking as being more comfortable than any "technical" fabric and also less smelly. I have a friend who has been a walking guide for years who has a habit of extolling the latest walking technology/band/whatever to me with a somewhat condescending enthusiasm. I had to laugh when he started in on the benefits of Merino wool for winter walking, especially as I was wearing a merino wool polo (turtle) neck at the time. I have always preferred natural fibres, and I did a qualification in Needlework that covered the qualities of different fibres so while I'm not up to date on what the modern tecnical fires are capable of I have a pretty good idea about what natural fibres can do. I didn't have wool or any natural fibre socks as a child either, with six of us my mother wanted us all in quick drying man-made fibres that needed little or no ironing. In the Britain of the sixties having a home dryer was un-heard of and we depended on a couple of over head racks (airers?) in the kitchen to dry our washing on rainly days. And I too discovered the joys of wool socks when I was able to buy my own clothes, also cotton and even some silk ones. I have found them far healthier for my feet and won't wear man-made fibre sock. Your comment doesn't surprise me in the slightest! My dad was an avid hiker who insisted on heavy wool socks in leather boots even on days when it was too hot to wear anything else except linen -- except that he firmly believed in wearing wool (actually, he preferably beaver pelt felt back before the creatures were critically endangered) cowboy hats for sun protection for just the same wicking properties -- but his particular demands for woolen socks and leather boots was all about absorbing moisture to avoid blisters. So when I complain about my feet getting hot, it's partly because I know that I, personally, am trying to release enough heat through my extremities that the qualities of natural fibers matter (to the extent that when I wear shoes in the summer they must both be leather but must also not be lined -- whereas even simple sandals may cause blisters, though I suppose such lovely socks might solve that particular problem). I hope you won't be offended, however, if I admit that I sewed myself a camel's hair coat over a decade ago (from "fur" that I dearly hope was combed from its coat rather than shaved!) and that it's the most luxurious garment I own. I don't have many occasions to wear it, but I've enjoyed it in everything from sub-zero wind-chill to a "garden variety" Southern California winter evening and it always feels a bit like velvet -- only softer! Why would I be offended that you made yourself a camel's hair coat? I'm glad you have a coat that makes you feel warm and comforted, and awed by someone who can make a whole coat (I'm not a seamstress. My mother could make tailored men's suits, plus anything else, but I'm of the "two or three seams make simple window curtains out of sheets" level.) Mother tried to teach me sewing, but aside from once making a dress from a Vogue pattern AND modifying the collar to suit me...I can sew on buttons, but that's all I do these days. It was the fear brought on by the realization that some camels may actually be shaved instead of having their fur collected as it sheds naturally that bothered me. The idea of a camel death leading to my comfort goes against all of my, "if humans have cared for/been cared for/farmed such an animal, then the only reason to kill it is to eat it, and even then my farmer grandpa's rule that "you never name anything you intend to eat" kicks in, lol. Honestly, even though I've been sewing all my life, if you could sew a Vogue pattern "back in the day" (their instructions didn't used to be the easiest!!!! ), you could probably make a "dressing gown" type coat if you ever want to. The simplest part turns out to be creating a lining, since that takes care of finishing any of the seams (and lots of other "fiddly" problems). There is nothing quite like the feeling you get when stepping out in a coat you have made! And I finally got the last yarn ends woven down in the Fiesta socks, so they'll be worn for bike riding tomorrow. First ride, then first wash. It's going to be very warm at 7 am and I should be in bed already.